When I took a good look a the exploded view of the tender I suddenly realised I had never built one before This 5000 is my very first tender locomotive. All others were tank locomotives. Ah, well, a nice "first" I'd say. A big but well-formed lump of white metal forms the base. I carefully measured it to see if it was twisted. But no,it lay dead flat on a glass plate, so that was good. The sides with the axle bearing needed a bit of outward bending as they were sitting on less than ninety degrees, tilting a bit inward so had to coax it a bit outward. Then flatness and squareness were again checked. The casting itself was of excellent quality with very little flash. The axles did not fit in straight out of the box. I needed to ream the "axle boxes" a bit. The casting had white metal track cleaners. They were clumpy and vulnerable. They soon bent and broke off. Very soon the white metal track cleaners had broken off. I wasn't too sorry about them. After soldering them in place I bent them to sit correctly over the rails. Although called track cleaners they are actually there to push large obstacles off the track. The keeper plate for the wheels proved a tad too wide, there always one axle protesting against normal work. I took off about 0.75 mm on both sides and from that moment all four axles performed beautifully. Then the construction of the superstructure started. All parts were taken out of their frets and carefully filed and sanded to life. with the one exception of the coal chute, which was clearly oversize. I first assembled and soldered the basic tank on the bottom plate. and added the coal bunker. Note. I first soldered the folded sides in place and then tried to insert the front sheet (arrow). Well that proved to be very hard. It took me a lot of tinkering before the tabs would slide into the slots in the bottom. My advice, should anyone want to build this kit, insert both parts together and then solder. Excess solder cleaned. I am satisfied with the result. During soldering I took the precaution to measure for squareness every now and then and the bottom plate sits nicely flat. Nuts were inserted to make the connection with the undercarriage. I like the way how DJH designes a holder for the nuts. It is far more secure than simply soldering the nut on the bottom plate straight away. And it must be secure,once the coal chute is placed you will never be able to get to thus nuts again. The coal chute was scraped until a good tight fit was achieved. The tender is now ready in it basic form. The 5000 is HO scale, so 1:87. I have a Bachmann NS 4300 which is essentially a Dutch livery version of the WD 2-8-0 meaning it is in OO scale, 1:76. The difference in size is quite evident. The handrails were bent on the jig of Bill Bedford Models, resulting in a quick and repeatable production of two sets handrails. I skipped the etched handrails provided with the kit, because these were square. The various ladders were also provided in the etches and they caused me a headache. As supplied they were very unprototypical and down right ugly with the flat of the steps in the wrong direction. Moreover, the rear ladder in reality had round bars instead of flat steps. I first attempted to get round bars into the ladder. I hand drilled eight holes which I guestimated by eye. Then I got the hunch to turn the steps by taking it into a pair of pliers and simply give it a 90 degree lurch. I was was quite happy they cooperated. I then soldered them from the back for reinforcement. I carefully filed the steps to size and rounded them at the front to mimic the bars. When I tried the same ply-and-turn procedure on the front ladder one worked well and the other simply fell apart. So it is not without risk. Despite my intial disappointment I managed to solder the lot together again with 180C solder. Later the ladder was attached to the tender with 140C solder and a super quick pass of a darn hot soldering iron. I also added lamps, air hoses and a middle lamp iron. 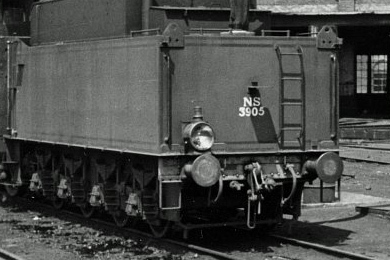 I left the latter vacant as many pictures show the locomotive with only two headlamps. I added a tube along the right hand side below the tender bottom. I suspended the tube on strips of 0.1 mm thick brass foil (yellow circle) which I twisted and then soldered into a suitably size hole in the tender bottom. Photos of the completed tender. The handrail knobs and their rails, the coupler and the buffers are only loosely fitted as they will remain separate until after painting. Saves a lot of masking. I replaced the originally supplied the handrail knobs, they were too big, and of the conventional type. I used Markits WD knobs.